You can get odds of 50/1, on any Aidan O’Brien horse winning the 2017 Epsom Derby! 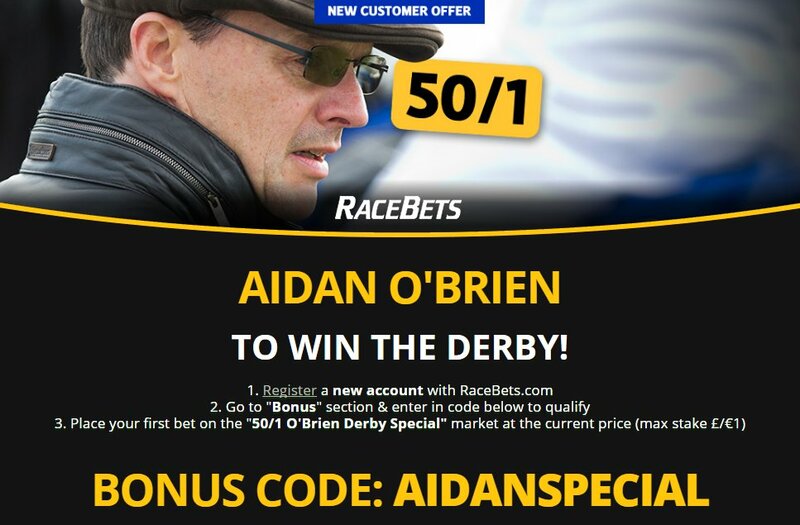 Join Racebets via our special links, use AIDANSPECIAL as promo code and get paid at 50/1 if ANY O'Brien horse wins the Derby! Aidan O'Brien inmates have already won the first 2 Classics of the campaign and he has a glittering array of talented horse for the most important race of the flat season - Cliffs Of Moher, Capri, Venice Beach, Douglas Macarthur, Wings Of Eagles, The Anvil and Finn McCool. Fancy Aidan O'Brien to win the Epsom Derby 2017? 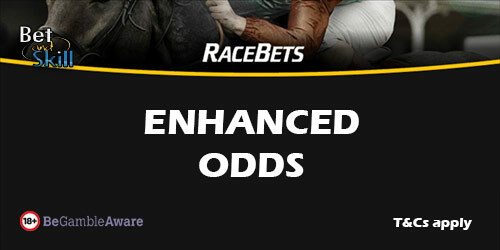 Claim a 50/1 price boost at Racebets! To find the 50/1 O'Brien Derby Special market, go to 3rd June on the Calendar, it is listed in the United Kingdom section. When you make your first deposit, Racebets will give you up to £50 as welcome bonus! Open a new account, enter the bonus code AIDANSPECIAL in the Bonus overview section, to qualify for the enhanced price. Then place your FIRST bet on the "50/1 O'Brien Derby Special" market at the current market price. Market can be found on Saturday 3rd June on the Calendar in the United Kingdom section. If Aidan O'Brien trains the winner of the Epsom Derby (3/6/17), you will be paid based on the market price you took first and then you will have the extra enhanced winnings amount added to your account within 1 hour of the market being settled. Customers using Moneybookers, Skrill, Neteller or Paysafecard to deposit will not qualify for this offer. RaceBets reserves the right, at its sole discretion, to amend any offer and its terms at any time, including the cancellation of the promotion without any prior notice. Any customer deviating from the promotional rules may be disqualified without notice. "Racebets offer 50/1 on ANY Aidan O’Brien horse to win the 2017 Epsom Derby!"